No vacation would be complete without plenty of beach looks! 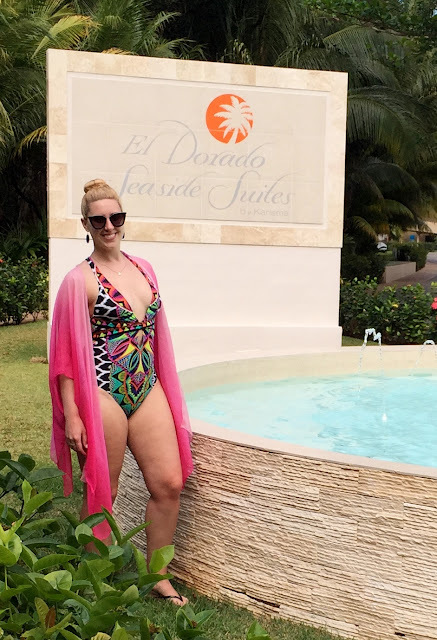 I typically pack a different swimsuit for everyday, but this year, I tried something different. I only packed four swimsuits and two cover-ups. I figured I'd mix and match my swimwear to keep things simple. This technique allows me to wear each individual item more than once without actually repeating an outfit. In today's post, I feature the looks I've worn with my pink ombre ruana. I really like this open-concept cover-up. By that I mean one that does not have to be put on over one's head. This jacket style is much more convenient to wear, plus it allows the swimsuit to be seen too. I like for my colourful suits to be front and centre!